« Traveling Thoughts: Don’t Missionary Kids Know Better? Traveling Thoughts about Ternopil–not Chernobyl! The Church of Christ in Ternopil, Ukraine, meets in property next to a huge city park that celebrates Ukrainian war heroes, most of whom died in 1944. The church that worships in that nearby building celebrates every Sunday One who is alive. Of all the eastern European countries that opened up after the breakup of the Soviet Union, Ukraine seems to be the single one where Churches of Christ are not just thriving, but growing with a post-Pentecost fervor. Much, if not most, of what Eastern European Missions does is in Ukraine; other “eastern European” efforts now locate most of their work in Ukraine, whereas 15 years ago they would have been active in several other countries. I’m not saying that there is not good work in Russia, Romania, Albania, Bulgaria, Hungary, Czech Republic, Slovenia, and Serbia, not to mention Kazakhstan and Croatia. While most of these countries have excellent works, they have become slow and difficult in comparison to how it was in the early years after the Wall fell, and so the fervor for those countries has waned among American churches in general. Not so in Ukraine, especially eastern Ukraine! Schools of preaching, television evangelism, school programs, along with strong national leaders, all are resulting in new churches being planted throughout eastern Ukraine, as I understand the reports. You still hear about American churches sending preachers, teachers, and others to Ukraine—and when you do, you can be 99% sure they are going to Kiev and eastern Ukraine. The one exception might be Ternopil, however, which lies in western Ukraine! Part of the reason why we visit new LST sites is to determine how healthy the churches are who have invited our teams, so we also ask about their history to determine the path they have taken to be where they are today. This church has followed an especially unusual path—and I’m not even sure they know it. Their history as a congregation starts after the borders opened, when Stephen Bilak returned to his own country to continue preaching the Good News. He had been doing it by radio for many years before he was permitted to re- enter the country in person. Thereafter, Christians in Michigan made Ternopil their personal mission site and came on their own many times. The church grew, and about twelve years ago, bought property. With their own hands they constructed a wonderful facility with an unusually large auditorium, offices, and classrooms, but also with a large apartment—two sleeping areas, two full bath/showers, great kitchen. The apartment itself is not so unusual , but that they built it for the people who would be coming to help them was extraordinarily unusual and unselfish faith on their part! Since then Brady Smith, missionary in Lausanne, Switzerland and Stephan Bilak’s son-in-law, has continued to come regularly to teach and serve this church. The Minter Lane church in Abilene has sent many to Ternopil and see themselves as a mentoring church to the Ukrainian congregation. Professors from Abilene Christian have come to teach and train. Are you getting the picture? A lot of Christians with many and varied resources have come and worked with and served this single congregation over its twenty-year history! The amount of attention paid to Ternopil is highly unusual. There is no church in Lviv, for instance, which is the much larger city into which one flies going to Ternopil, which is about a two-hour drive on a very bad road away! Why Ternopil and not Lviv? When I try to come up with an explanation for eastern Ukraine’s mission efforts thriving as opposed to western Ukraine’s single thriving effort, one correlation appears to me especially obvious, that is, where many workers have gone for many years and where American churches have provided strong financial support, the churches are thriving. Where individuals have worked with little support, either in personnel and/or financial resources, the work seems weak. Or even worse, that area has been deemed unreceptive! Many people know missions in Ukraine better than I, so there may be other factors and explanations. I know the work in Kiev has been a rollercoaster ride, with lots of good things and lots of disappointment. I’m pretty sure that is because from the first days of the work in Kiev by Churches of Christ, there was division among the churches over a whole slate of issues. It was sometimes a little hard to know that we were Christians by our love for one another! I’m so thankful for the church in Ternopil, for the strong and faithful leadership, for their fearless desire to grow the kingdom in their hometown. And I’m thankful for all those partners in the Gospel over many years who have supported and mentored and served this church without making it dependent nor stealing its great passion for Christ. And, who is willing to start a work in Lviv? LST will help! Mark – I was a missionary in Ukraine for almost five years. I started with doing LST in 1995. It was a very rewarding and frustrating experience. I remember meeting American missionaries who had gone to Donetsk (in the south-east) and were going in preaching about the evils of instrumental music right off the bat. To say that I was upset about that would be an understatement. I failed to see how the gospel was preached in any way. I remember having a discussion with one gentleman who was converted in 1991. He said “our enemy is the Baptists”. I told him that our enemy is Satan, not the Baptists and was shocked that he would come up with that. Obviously such a thought was planted in his mind. So many mistakes were made in so many ways that it boggles the mind. I just hope and pray that the Holy Spirit was able to move and change some of the hearts of the people there to believe in the true gospel and follow Jesus Christ to the best of their ability. It was a wonderful experience and there were a lot of great people who spread the gospel there in many places with great success. One has to go back there and see the results after so many years to appreciate it. You are right: many factors have gone into the growth of the Ternopil Church of Christ. I can think of two very important ones. First, Volodymir and Valya Prylyudko have been a strong, faithful, stable–and local!–couple who have done their best to learn God’s word and practice it in their personal lives as well as in church polity. They love Christ’s church, and they have done all they could to make it available to their fellow Ukrainians. Their discipleship in Ternopil has been invaluable. Second, the other non-native supporters of the work in Ternopil (mostly American) have not attempted to direct or to otherwise control the leaders of the Old Park church. Remarkably, this wide variety of supporters have remembered their own Restoration roots, allowing autonomy even to this non-American congregation in western Ukraine. I hope that future American supporters will remember this fact: our financial support does not give us ownership of another congregation. The church is still Christ’s, not ours. Great advice, Bill. Thanks for the additional insights. Thank you! 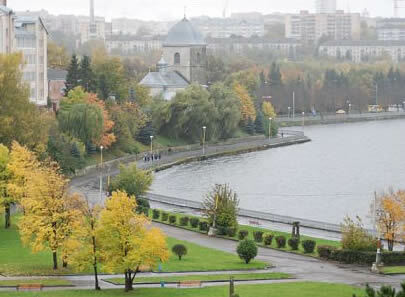 Your blog article captures the Old Park Church of Christ, Ternopil, Ukraine beautifully. Slavic World for Christ Committee, under spiritual guidance of the Minter Lane Church elders, will be happy to give more information about this wonderful church family. Contact: Minter Lane Church of Christ, Office@minterlane.org.